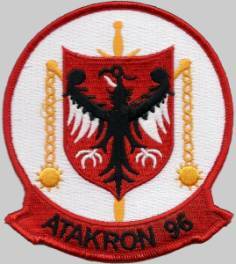 VA-96 was a short-lived Attack Squadron of the U.S. Navy. It was established on 30 June 1956, and disestablished less than two years later, on 10 April 1958. Its nickname is unknown. 4 Jun 1957: The squadron’s commanding officer, Commander M. K. Dennis, was lost in a night midair collision while operating from USS Kearsarge (CVA-33) off the coast of California. Sep 1957: Kearsarge operated in the vicinity of Taiwan following the build up of Chinese communist forces opposite the offshore islands belonging to Taiwan.